Knowing we were not fully aligned, I stepped out of the group and began to move to the left, holding an invisible kind of line connected to this mountain. I knew we had to come into perfect alignment in order to break through. Finally, after continuing to move little by little to the left, watching this line of communication eventually settle into place, I waited. After a few moments I saw something begin to move in the distance. Slowly, but steadily I saw three distinct beings emerge from the heart of the mountain. Closer and closer they came until I saw what they were. 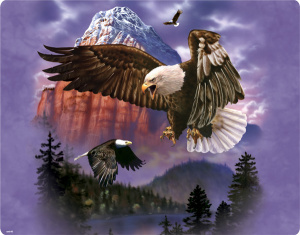 Three large eagles, stately, bearing immense authority and grace. As they drew closer I knew they had been summoned. I also knew they were looking at me. I woke up feeling the immensity of Their Presence. It didn’t take long to interpret their meaning. This is a message for the Church in this hour for this nation. It is the Father, Son, and Holy Spirit speaking to us as we are coming together and interceding for a spiritual revival in the land. Until we acknowledge the fullness of each person of the Godhead, we will not see the fullness of heaven come to the earth. We cannot pick and choose which expression of the trinity we prefer. We cannot focus on one at the expense of the other. Each represents and expresses God’s heart and character in a different dimension. God, our Creator and loving heavenly Father. Jesus Christ, the only way to salvation through the cross. Holy Spirit, the full expression and manifestation of the Father’s heart. They are ONE. They cannot be divided. If we want heaven to come to earth, they must come together. Believers across this nation have been divided by various doctrines and beliefs concerning the Godhead that have defined and marked us rather than the simple yet profound reality of our God who is Three in One. Heaven has heard our summons and has been moving ever closer. Yet, are we ready to receive the fullness of the Godhead and how He might come and work among us? Can we align our hearts, thoughts, beliefs and prayers in order to see the fullness of heaven released? They are waiting on us.